KFC really FCKed up and had to deal with a chicken shortage. Let me preface the story by saying I would never go to a Kentucky Fried Chicken restaurant. I mean, who would willingly grab a bucket of diabetes for the entire family? Just the idea gives me hardening of the arteries. Earlier this month, over 600 KFC branches in the UK were shut down because of during the chicken shortage, leaving customers across the UK panicked and pissed off. This KFC chicken crisis caused by DHL’s delivery failures could have been a nightmare, but a rapid strategic response has ensured the brand will benefit in the long run from increased awareness and a boost in consumer demand. The company turned clucking hell into a social media win. Other fast food chains acted quickly, showcasing their dead chickens proudly, as if to say, “Look! We have dead chicken and KFC doesn’t! Come taste our dead chicken!” In a statement, KFC apologized for denying people their fix of finger lickin’ good chicken. As of Monday night, just 300 of KFC’s branches were still open, according to TIME. It can’t be said that KFC didn’t try their best. They limited hours, closed some locations, and offered free Rice Boxes (because that sounds appetizing). In one day, KFC reverted to the Dark Ages. Zero chicken = Damn, all we got is rice in a box… One guy had such a hankering for KFC that he called the police. Then Burger King had to step in, giving one super-distraught KFC frequenter a year’s supply of fresh King Boxes. (Side rant here: What’s with the UK fast food places and their boxes? Is everything in a box? Rice box, king box, taco box, fallafel box, chili box…where does it end? Fun fact: Burger King is the fifth-largest fast food restaurant chain in the world by number of worldwide locations. Fourth? Yep, your favorite chicken(less) establishment, KFC. Before you get your feathers in a ruffle, KFC saved beak – um, face – by issuing a full-page apology in two UK publications. You know what is ideal? Not going to KFC. However, this is a great use of marketing right here. A PR apology that doesn’t sound pompous or fake? FCK, that’s some epic copy! Maybe other companies need to take a FCKing page out of KFC’s FCKing book. Swear at your customer. That way, they can’t help but feel grateful to you. You understand them, for FCK’s sake! 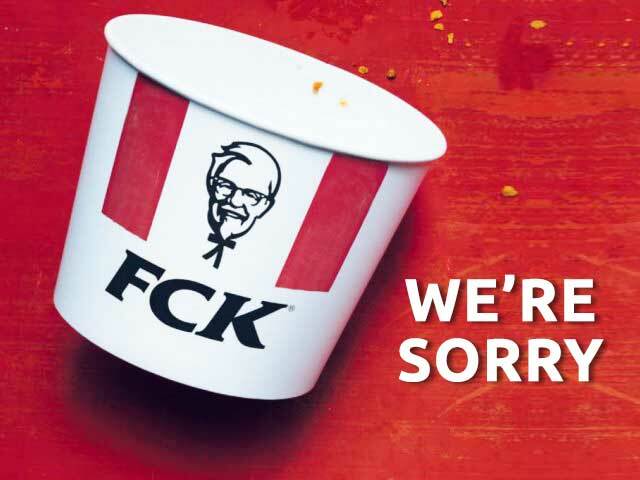 If they feel like a KFC without chicken is a federal offense (on par with damaging public mailboxes, or assassinating the President of the United States), then throw a couple F-bombs in an apology and voila! They’ll all be running around their nearest KFC like a chicken with its…well, you get the idea. And where will I be? Nowhere near Finger Lickin’ Grease Bucket. There’s something about the Colonel’s face that reminds me of both Big Daddy from Django Unchained and the Civil War. It’s not a good combo. Though, I can’t wait until Arby’s mimics their chicken brethren: Sorry for the Rabys!